Stephen Bassett is ready for Hillary. 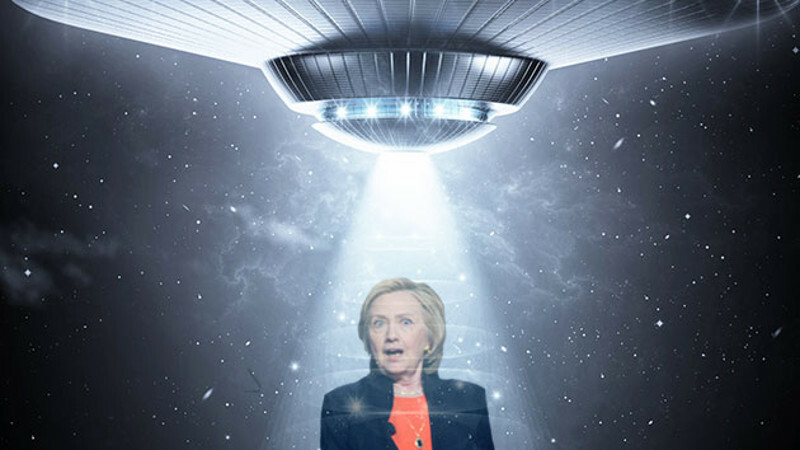 Bassett, Capitol Hill’s only registered UFO lobbyist, anticipates that another Clinton presidency will offer another shot at what’s long been the Holy Grail for extraterrestrial enthusiasts: full disclosure of what the US government really knows about aliens. “This is the most important issue in the world,” he says. Podesta’s interest in extraterrestrial phenomenon is nothing new. In 1998, theWashington Post described his “fanatical devotion to ‘The X-Files’—especially FBI agent Fox Mulder, with whom he shares a penchant for obsessiveness and paranoia.” Grant Cameron, a Canadian UFO researcher, unsuccessfully tried to get the Clinton Library to release records detailing Podesta’s X-Files-themed 50th birthday party, which was apparently thrown by the first couple—who may have dressed up as the show’s main characters. While the tweet may have been tongue in cheek, UFO activists went nuts over it. “It was a big frickin’ deal,” says Bassett. “Someone who has been an adviser to the president of the United States, and is leaving his job, and it’s already been announced publicly that he is going to be a key adviser to the heir apparent to the White House, the de facto candidate, does not, on the day he leaves the White House, put out a tweet about UFOs. He’s inviting hundreds of articles to be written about this tweet.” Podesta did not respond to a request for comment. Over the next three years, Rockefeller and his associates corresponded and met with officials in the White House’s Office of Science and Technology Policy, according to documents released as part of a records request filed by Cameron. The effort, known as the Rockefeller Initiative, helped push the Air Force to produce what it characterized as the definitive report on Roswell. (UFO activists were not satisfied, to say the least.) The initiative also may have helped spur a 1995 executive order that declassified millions of records, of which the vast majority were not UFO-related. In August 1995, Rockefeller met with Hillary Clinton, and perhaps Bill, at his Wyoming ranch. In a memo, the then-director of the White House Office of Science and Technology Policy, Jack Gibbons, warned the Clintons about Rockefeller’s agenda before the visit. “[Rockefeller] will want to talk with you about his interest in extrasensory perception, paranormal phenomena, and UFO’s,” he wrote. Gibbons said he’d tried to persuade Rockefeller “not to bother you with this issue” and to focus instead on the administration’s science and technology policies. Rockefeller, he continued, “knows that we are trying to be helpful in responding to his concerns about UFO’s [sic] and human potential—and that we’re keeping an open mind about such matters—but I’ve made no secret about my conviction that we must not be too diverted from more earthly imperatives.” Gibbons could not be reached for comment. Bassett says the Rockefeller Initiative proves that the Clintons were interested in pursuing meaningful UFO and extraterrestrial disclosure. “You don’t go through all of this, and have this much work, just to amuse a billionaire,” he says. “If you did, you’d have to answer to that.” Bassett has been lobbying for congressional hearings on the question of UFO contact with the US government. He says that forcing the Clintons to discuss the Rockefeller Initiative is key to his strategy. “I call it the exopolitical blue dress,” he says, referring to Monica Lewinsky’s infamous blue dress and “exopolitics,” a term for the intersection of terrestrial politics and extraterrestrial beings.